Andy and Christine are both new clients at St. Francis House. At 78 years old, Andy is retired and lives on a fixed income from food stamps, Social Security and Supplemental Security Income. He has no family in the area and lives by himself. A few months ago he became ill and had to go to the hospital. With no family to take care of things, his gas bill wasn’t paid, and the gas was disconnected. Though he had the money to pay the bills, he came to St. Francis House for help because with the late fees and disconnect fees; he didn’t have quite enough money to get the heat turned back on. Christine is sixty years old and unable to work. She also is on a fixed income receiving Social Security, food stamps and Disability. She lives with a roommate to help make ends meet, but sometimes she falls a little short. This month she had an electric bill that was a little higher than normal. 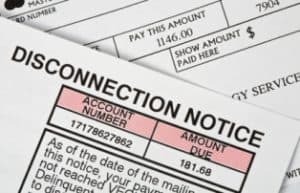 She could pay most of it but needed $44.00 to avoid the utility being disconnected. Thanks to your donations, we were able to help Andy and Christine. Sometimes changing a life costs less than going out to dinner. And the results are worth far more!